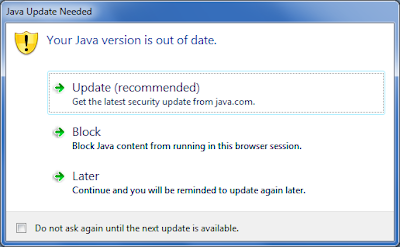 If you are running 11.1.2.3 and use the EAS web console with Java 7 then make sure you don’t apply update 45 or the console will stop working. This has already been blogged about by the Proactive Support team but I thought I would give another update in case you have not seen it plus there is an Oracle support document available and the issue has now been logged as a bug. If using Java 7 and a version prior to update 45 when opening the web console you probably see the following warning. If the java console is enabled numerous java exceptions will also be outputted. The obvious solution is not to apply update 45 as update 40 works fine but I know that is not always an easy option when updates are automatically controlled internally, alternatively the EAS thick console can be installed until the bug has been fixed, I know multiple java versions can be installed and enabled separately but I am not sure if that workaround is possible in this situation. I will update this post when there is any further updates or a patch released to address the bug. 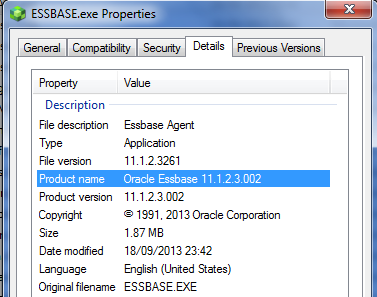 Update 6th November 2013: 11.1.2.3.003 PSU now available for Essbase related products and are correctly packaged. 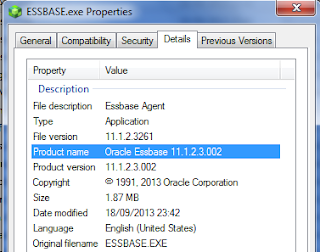 I was intending on applying the latest patch set update 11.1.2.3.002 for the Essbase related products and noticed an issue with the Essbase Server and RTC patches which I thought I would share. 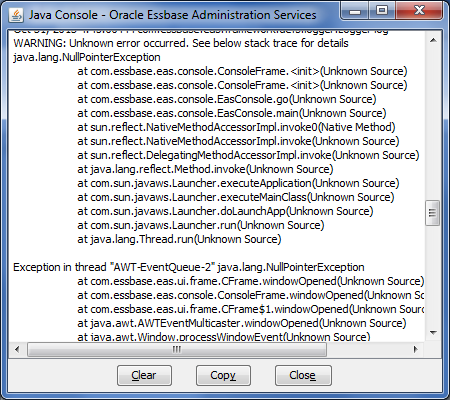 Now I know that the problem will be soon rectified and I will update this post when it has been updated in Oracle Support. If you have applied the 002 PSU or have downloaded and are planning to then it is worth revisiting as it looks like they have been incorrectly packaged which seems to affect all platforms. Once downloaded and extracted the patch number in the directory structure is incorrect and it is the 001 patch number not the 002 one. If you take a look at the properties of the files in the PSU then they look to be correct. The files are correctly displaying 11.1.2.3.002 so it looks like patch was just incorrectly packaged up. You may be thinking you can just change the directory name to be the correct patch ID of 17417313 and then apply the patch. You may feel comfortable leaving the inventory with incorrect information but it is not an option for me so I looked into fixing it as all the Essbase product files indicate they are for the 002 release so it could be an inventory problem. I rolled back the patch as I only applied it to demonstrate what happens. Within the PSU directory structure under <patchid>\etc\config there is the inventory xml file. Editing the file confirms the reference id is incorrect and is for the 001 release, the unique patch id looks to be correct as it is different than the one for the 001 release and if you search for it in Oracle Support it does correctly return the 002 PSU. 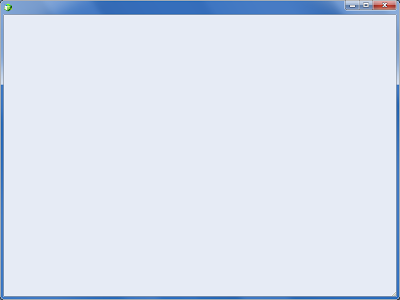 Fixing the file only requires a few changes. The reference id number was updated to be the correct ID for the PSU which is 17417313. As it is a cumulative patch I left in the base bug information for 11.1.2.3.001 and added in the 11.1.2.3.002 PSU information and that is pretty much all there is to it. Running the inventory report confirms the patch ID is correct and the bugs fixed are for the 001 and 002 releases. I carried out the same process for the Essbase RTC 002 release as that has been packaged up in the same way, all the other Essbase related product patches seem to be fine. I expect the files will be fixed in Oracle support in the near future which makes this post obsolete but I thought I would share anyway.